Padua is often tragically overlooked due to its close proximity to Venice; it is also almost always described in terms of comparison with Venice. Luckily, Padua, once second only to Rome in terms of wealth, is a gorgeous city with lots to offer visitors and plenty of charm all of its own. The fabulous architecture of the old town, dating back as far as 1,000 AD, is a magnificent backdrop for the wealth of culture the city contains. The main attraction is the cathedral dedicated to St Anthony. The high altar is decorated with bronzes by Donatello, who is also responsible for the proud equestrian statue of General Erasmo da Narni (il Gattamelata) that stands in the Piazza del Santo. 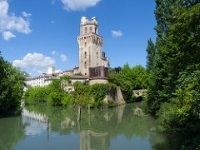 Padua also has picturesque canals, a number of interesting markets, and many impressive landmarks. It is a city seemingly full of beautiful frescoes, with many lovely churches to house them. It also boasts Europe's oldest botanical garden, established in 1545. Some people argue that the city also has a more fun and festive nightlife than Venice, due to its youthful population - the University of Padua is Italy's second oldest, established in 1222. Padua is situated just 21 miles (35km) west of Venice, and is a very worthwhile daytrip destination.